MP4 = the name of a video file format. 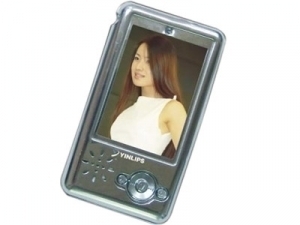 An MP3 Player only plays music. 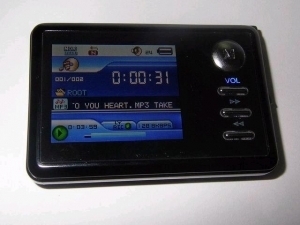 An MP4 Player plays music AND videos. HDD = hard disk drive. Instead of storing your data on flash memory, the player has a micro hard drive inside, meaning hugely increased capacity for your data. Expandable = the player may have some onboard memory, but you can also insert flash memory such as SD cards or MMCs to increase your storage space or share videos with friends. OTG = on the go. OTG MP4 Players let you connect to any other USB device, not just a computer. Why would you want that? Well, it means you can easily share/swap music and videos with friends’ media players, and quickly transfer photos to and from digital cameras, digital camcorders, and portable DVD players. DivX = a new codec (i.e. compression format) for video files, that allows you to get better movie quality into less storage space. It’s a very popular format for “ripping” (copying and compressing) whole DVDs to your MP4 Player. Super-long and VOX voice digital recording from mic, or radio. 1.8-inch screen, 65,000 full-color OLED display. · Multi formats support: AMV, MP2, MP3, WMA, WMV, ASF, WAV etc. Movie play function, support ASF format of MEPG-4, or by the software transfer into ASF format to play. Combining great design, the latest technology and high performance components from well known manufacturers.  2.5 inch High Definition Display TFT Screen, 260K true colours .  Support the SD/ MMC card, Max.1GB for SD card .  Audio play function, support MP3/ WMA /WAV etc .  Photo browsing function, can display the pictures in all kinds of Digital camera.  Many Repeat Mode choice，Volume Control .  Build-in microphone, support Line-in record.  Movie play function, support ASF format of MEPG-4, or by the software transfer into ASF format to play.  Built-in High Quality Rechargeable Lithium battery . Loudspeaker and double earphones jack supportable. 1.5-inch screen. 65,000 full-color OLED display. 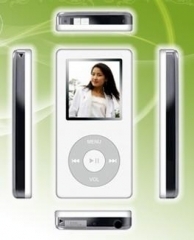 Play your movies and enjoy music everywhere or use this Mp4 Player also as Udisc with or without Special space. · Support various audio formats: such as the MP1, MP2, MP3, WMA, WMV, ASF, WAV...etc. 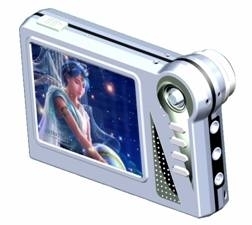 It seems for China hi-tech designers, having an MP4 player with multimedia playback and expanded software functions sometimes just isn’t enough! These 2-in-1 Chinese MP4 Digital Cameras let you take high-resolution digital photos, then view and manage your photos on the device, and also browse pictures, watch movies, listen to music, and read eBooks.